Geisinger president and chief executive officer David T. Feinberg addressed a crowd at Toftrees Resort, sharing what the medical system is doing to keep patients healthy. STATE COLLEGE — With six locations in Centre County, Geisinger has an impact on the health of people in the area. 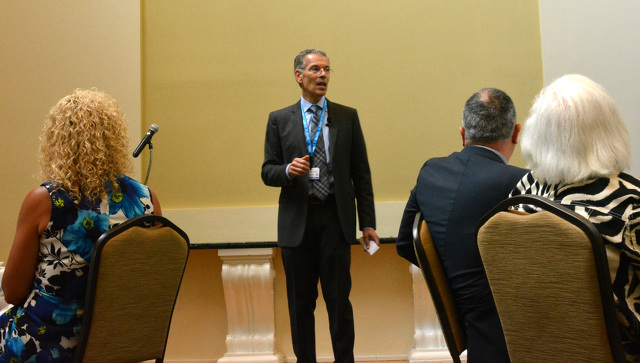 The medical system’s president and CEO addressed a group of community leaders and health care providers Aug. 7 at Toftrees Resort, and he said that Geisinger is working on ways to help keep patients out of the hospital. With that goal in mind, Feinberg said Geisinger is growing in genetics, diabetes treatment and in-home treatment as ways to help patients. “Whether it is your zip code or genetic code, our idea is to keep you as healthy as we can at home,” said Feinberg. He said Geisinger understands that hospital visits are expensive, and the at-home program is especially helpful for patients who are the most sick, with the largest doctor bills. “We said to the top 5 percent of our most sick patients that we want to do something different. We want to keep you out of the hospital because it is expensive, it is disruptive and not always good for you, so we are going to provide all the care we can for you at home,” said Feinberg. He said this includes having a doctor at the house two to three hours a day, along with nurses, social workers and other providers in order to keep people out of the hospital as much as possible. “This allows us to take care of people the way I think I would want my family to be taken care of,” said Feinberg. As diabetes has grown to become a larger issue in the county, Geisinger is looking at ways to prevent the disease before it starts by changing people’s eating habits. It recently opened a "Fresh Food Farmacy" in Shamokin that ”prescribes” and provides free nutritious groceries to patients with diabetes and food insecurity who don’t have enough money for food. Feinberg said the program provides patients with education and personal attention to help them see dramatic changes in their health. Geisinger hopes to open a similar facility in Lewistown in the upcoming months, with funding from the state and help from local food banks and Weis Markets. He said he hopes insurance companies eventually will see these types of programs as something they should cover. “After all, it has less side effects, costs less money and has a better outcome than the medicine we are giving people anyways, so we just think of it as food as medicine. So in the same way that medicine would be covered, of course we want to cover blueberries and things like that,” said Feinberg. Feinberg also discussed the work Geisinger has done on its genetic program, which he touted as the biggest in the world, and said it can help prevent illness before symptoms occur. He said that Geisinger is using DNA assessments as part of free routine care to help patients. As far as Centre County goes, Feinberg said Geisinger is adding more midwives to the Gray's Woods facility and increasing the orthopedics program in the area as the population get older. “And, we plan to continue to grow in Centre County,” said Feinberg.